We are proud to say we are staunch supporters of the British egg industry; welfare in the UK is amongst the highest in the world and our great British farmers are willing to listen to consumer concerns on welfare. 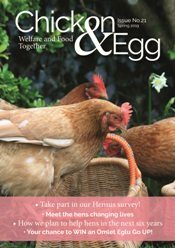 Making a difference to hen welfare means we need to listen to the farmers too and learn more about why they farm as they do. We think it’s important to understand the farmer’s view on the egg industry today and we will be running occasional interviews with a range of different egg producers so you can learn more about our farmers who are Flying the British egg flag. 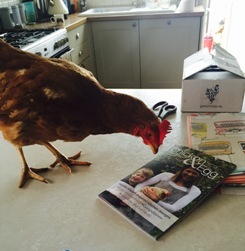 Andy and Mandy Johnson set up Laydilay Organic Eggs in 2004 and strive to 'put the chicken before the egg'. Their small flock roam across 18 acres of rolling hills and woodland whilst producing organic eggs for the local area. Cackleberry Farm, just outside Stow-on-the-Wold, has been home to 5 small flocks of Arlington White chickens, which roam on thirty acres of luscious Cotswold countryside. Ken Cottey runs a free range farm in the Blackdown Hills of Somerset. Blackdown Hills Westcountry Eggs is a family run business which gives welfare top priority. Mike Wilkinson's 48,000 hens live in multi-tier units where the birds are free to move around the large shed and roam outside during daylight. Helen and David Brass produce only free range and organic free range eggs, on their family owned business, The Lakes Free Range Eggs company, run deep in the heart of Cumbria and recently won a ‘2014 Best of Sustainable Supply’ Award. Birchgrove Eggs is owned and run by Tony and Gwen Burgess. They have small free range flocks which roam their 30 acre farm in Aberystwyth. Beryl & Roger Hosking run free range farm Highfield Happy Hens, an award - winning organisation which offers an opportunity for troubled youngsters where they can learn life skills and earn a living at the same time. Bob and Helen Kingery won the title of Producer of the Year 2012 at the British Free Range Egg Producer’s Association Free Range Awards. John Widdowson is a shining example of what free range farming is all about and best of all, he genuinely enjoys seeing his hens enjoy free range living on his 80 acre farm in Devon. The family business started with 6 hens owned by their parents in 1958 and is now run by Andrew and Richard Higgins, with Andrew's sons Will, Charlie and Henry.